Sweet Evil surprised me in many ways. I’m sure if I actually broke everything down and really thought about the story, there would be a lot I would complain about. But I’m not going to do that. I enjoyed myself while reading Sweet Evil, and I refuse to deny myself this guilty pleasure by analyzing everything. I really liked Kaiden. I mean, really. He’s so hateful and…well, evil….but given his genetic makeup…I don’t know! Normally this is a guy who would irk me. He is your typical bad boy (equipped with an English accent, even) but there was just something about this guy (or the way I imagined him, anyway. And trust me it wasn’t just the accent) that left me swooning. I wasn’t really a fan of Anna, though. She was okay at first but toward the second half of the book she bordered on pathetic, and I was resisting the urge to skim. The romance is what drew me into this story, plain and simple. It’s not that the plot wasn’t interesting—it was. I think it’s the fact that I’d plotted and written a few chapters of my own story involving the deadly sins, and now I feel like it’s been done so I’m no longer feeling my own story. Ha! So I really had to keep reminding myself to forget about all that and focus on the story. The romance was hot, the characters were great if flawed, and the plot was engaging when I allowed myself to enjoy it. The first half of the book is almost too hot though, enough so that I was thinking about how much I wished the characters were a few years older. I didn’t like the ending. That is probably my only disappointment. The second half of the book wasn’t as interesting as the first for me, but I was definitely still enjoying the story. But then comes the ending, and I just wasn’t satisfied. Sweet Evil is an engrossing read that I think a lot of people will latch onto. I know I will personally be on the look-out for a sequel, assuming a dreadful triangle doesn’t appear. I've heard a lot of good things about this book, and will be looking forward to picking it up! Sounds like a very steamy book. I'm definitely in need of one of these. Hopefully there will be a sequel so you'll be more satisfied! yay for Sweet Evil! I've been following the blog tour for this book, and I'm learning more about this book and liking it more and more. Especially the trailer! It's so mysterious! And I totally agree, I hope a love triangle doesn't appear. Other than that, I'm ready to read this one! Thanks for the review! 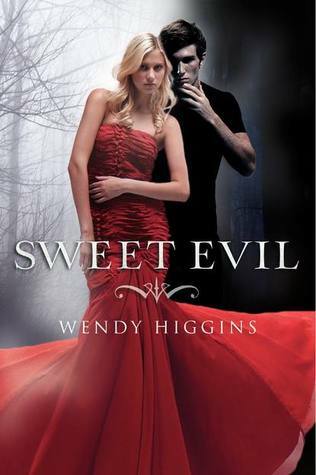 I've been looking forward to Sweet Evil too because of the love story. glad that part didn't disappoint you. now i'm really interested reading this one. This book sounds great. Love the cover, what a great red dress. Loved the review. Definately adding to my must read list. Thanks for the review and recommendation. I don't normally read YA books but this one sounds pretty good. Thanks for your .02! Thanks for the great review - this is one I've had on my wishlist and now I REALLY want to read it, and soon! Great review! I've been wanting to read this book for awhile now! can't wait to get my copy soon. Great review, I am so excited to read Sweet Evil! A romance that's too hot, you don't hear that very often haha. This does look amazing, I can't wait to read it! :) Great review. I was debating whether or not ot get this book but your review convinced me! Thanks for the great review! This definitely sounds like a great plot concept. Thanks for the review! I just got this book and glad to hear that the love interest is hot and dangerous - perfect combination! I hope I find Anna a better character than you did, but it's good to know that you would still want to read the sequel! Sounds interesting. Can't wait to read it! I still need to read this and hopefully I will enjoy it. You should try to continue your story even though it's been done you can always add your own flare and make it something totally different, good luck w/it! Oh I hate when the ending is disappointing. I just finished a series that I was totally into and the ending was... so completely disappointing. I still want to read it though. It looks so good. Or maybe it's the cover! I'm sorry the ending was satisfying, I'm a little worried now because this book was so high on my tbr list. Thanks for the honest review! I'm really happy that you liked Sweet Evil. Really happy. I won a giveaway recently, and Sweet Evil was one of my picks. Guess what? I chose it. I went into it completely blind because lo and behold, that cover just drew me in. Now I know that I made the right decision, so thank ya very much! I finally got to read Sweet Evil and loved it. I'm excited for the sequel! I agree with you on Kaiden, he was one that ticked me off... a lot, but there was just something to him that pulled me in. I like him a lot and I think there is a lot more to him than what was given in sweet evil and I hope that comes out in the sequel. Thanks for your honest review! I was kinda iffy on this one because it struck me as yet another love triangle drama book, but I may have to pick this one up. I won this a few months ago and just haven't gotten around to it. I appreciate the honesty of your review, and am looking forward to reading this book. Especially since you mentioned that Kaiden is equipped with an English accent. I love guys with accents. I loved this book such a great read can't wait for the sequel! Love the video and the dress she is wears on the cover is to die for! Also very good review.